Adamo Macri’s recent exhibition, Identity Matrix, held in Montreal’s Erga Gallery (November, 2017), is certainly well named. The collective portraits bring home the fact that viewers should be wary of making absolute assumptions about his art, however much this particular admirer can never resist feeling and thinking about interpretation. Every Macri image isn’t so much an end result as it’s an endless process. Matrix, a noun that implies creativity, is not finality, but development. Identity: well, Macri’s art displays many, at times paradoxical, identities: the becoming and forming, the magical and mysterious, the mythical and the scientific. Every picture invites immersion and advises caution. I imagine the artist speaking: you think you see the real person you think you know, but you see what mask I wear and what you wish to see, which says more about yourself than me. And what “real person” or “me” are we talking about anyway? Can I, the viewer, make sense of these original and extraordinary portraits? If self-portraiture is a form of autobiography, then whose particular life do we see, for example, framed in Pinus Attis, Ţepeş, or Memento Mori? They are not simply pictures of the artist dressed up for a Halloween party. When I study a Macri portrait, or several in a row, I am looking at autobiographies of alternatives, of depictions or disguises, or to use his own term, identities, even if the artist proclaims the picture to be a self-portrait as in the ironically entitled Self-Portrait 2011. I’ve commented upon this work elsewhere as “an example of his fluid, expressive and mysterious work, imbued with notions of the ever-changing self” (Hirsute Pleasures). I am often befuddled in a good sense by Macri’s constant shifts and daring, by the artist who never presents the same face or “self” twice. He challenges us to look where we haven’t looked before, and he defies our interpretations, among which I include mine. It’s always wise to be self-effacing in front of art, so I shall try. Having written extensively about Macri’s art, I've accepted the fact that imagination leads me into obscure nooks and crannies of a speculative maze. Many admirers do the same, according to their predilections and lights. No one has a monopoly on meaning here. That, dear reader, is at least one of the virtues of the man’s art, and explains why I haven’t come to an end of my own quest to feel, see, and understand the art. No sooner do I pause to rest and think that, yes, this much is true, this is done, then Macri emerges with another portrait, another way of perceiving, another identity, and I am enticed further into the essential mystery of his art. In my self-created labyrinth, where a Minotaur waits to devour me if I tread dangerously close to his lair, I am amazed (pun intended) by the artist’s versatility and disturbed by the art’s implications. For lack of a better word, I feel compelled, a willing compulsion, if that’s not a contradiction in terms, to go exploring again. In the ancient story, Theseus unwinds a ball of thread, given to him by Ariadne, as he wanders the maze, knowing that he'll find the way out. Protected only by my thread of desire to understand, I don’t fear the Minotaur. 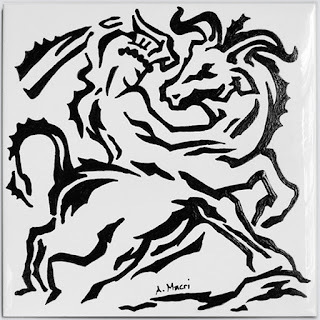 It’s interesting to discover that Macri’s astonishing portfolio contains a drawing entitled Labyrinth of Crete. The Ancile portrait demonstrates Macri’s coherent and fundamental vision of identity as fluid rather than fixed. He creates or grows any number of “selves,” designing them in whatever manner is relevant to his vision, freed from gender restrictions or social expectations. He has created it with the same attention to colour, pose, props, costumes, theatrical make-up, etc., that he has given to all his portraits. Nothing here is arbitrary, nothing is irrelevant, nor is the allusive name. If one must have a shield manufactured to one’s specification, what better source than the forge of Hephaestus, known for providing useful tools to the gods? Recall how effectively his steel-mesh net ensnared Mars and Venus (or Ares and Aphrodite) in their sexual embrace. Not even their divine powers could free them. Enraged by the death of his beloved companion Patroclus, who was killed in battle by Hector in the Trojan War, Achilles appeals to his semi-divine mother Thetis to help arm him well in pursuit of his revenge. Answering his plea, she commissions Hephaestus (Vulcan) to forge an adamantine shield, and the god of the forge produces one of intricate design and significance. Fashioned with symbolic scenes, the shield is thoroughly described with all its elaborate ornamentation in Homer’s Iliad (Book XVIII). One need only Google “shield of Achilles” to see representations of it. There is also the myth of twelve sacred shields (ancilia) housed in the Roman temple dedicated to Mars. Given the militarist nature of the Roman Empire, divinely sanctioned shields are to be expected. 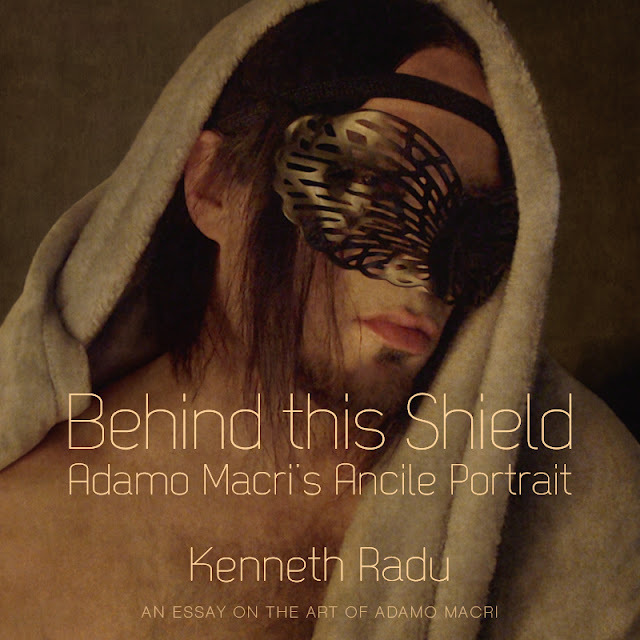 Nor should viewers be surprised to sense something priestly about Macri’s Ancile portrait, a sacerdotal quality evident in other portraits by this brilliant artist, especially in Leaven’s Freedom and the Reichian Orgone Box. I don’t believe that Macri depicts a Roman warrior in this superbly executed portrait, unless it’s one who has bathed after a bloody struggle, and then put on a mask to attend a costume party in the Emperor’s palace. Nonetheless, he deliberately draws our attention to the idea of shield as relevant to deception and the illusion of external appearances, or the protection of hidden identities. Also, the aura of gentleness and the soothing textures work against notions of blood and violence. There is such tenderness, almost maternal, suggested by the gentle tilt of the head and seemingly inexpressive face, that I am reminded of Madonna portraits (e.g. Sassoferrato, Perugino). Nothing like an actual shield is apparent. I say apparent because a shield as symbol is, in fact, implicit. Behind this imperceptible shield is another, and another is behind that. We cannot reach to the immutable core of identity of this well-shielded artist, who delights in mutability. That is a basic premise of his art. Similar to coloration in the Orgone Box and Leaven’s Freedom portraits, Ancile is rich with subtle shades of the evening desert. The head is partially hooded by a plush, light brown towel or shawl or monk's cowl; the hair, perhaps damp or recently dried, hangs down both cheeks, as if the figure has stepped out of a metaphoric shower of gold and sand. 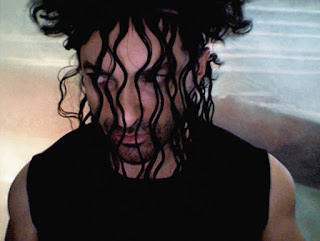 Speaking of hair, which I have in fact done in the essay Hirsute Pleasures, has any contemporary artist made as much imaginative use of hair as Adamo Macri? But I digress. He imbues the “priestly” portraits, if I may use that descriptive term, with a kind of spiritual earthiness. Quiet or subdued, the figure with a slightly reclining head, a characteristic pose in Macri’s portraits, is also confidently androgynous. Despite the hirsute features (beard, chest hair), Ancile incorporates all genders. A Macri portrait turns any notion of biological certitude on its head; the figure, therefore, can be whatever one wishes it to be. The black headband, a familiar accoutrement in Macri, suggests something more than we see, a further development, or a cultural provenance of which we remain unaware. Like all his art in the Identity Matrix exhibit, Ancile reveals Macri’s multi-media mastery of his sources and techniques – painting, photography, cosmetics, costumes, video – to create a stunning holographic effect, a vibrancy, as if a living person has paused in order to be framed, his performance momentarily frozen. But what person is it? The artist himself only in the most superficial sense. 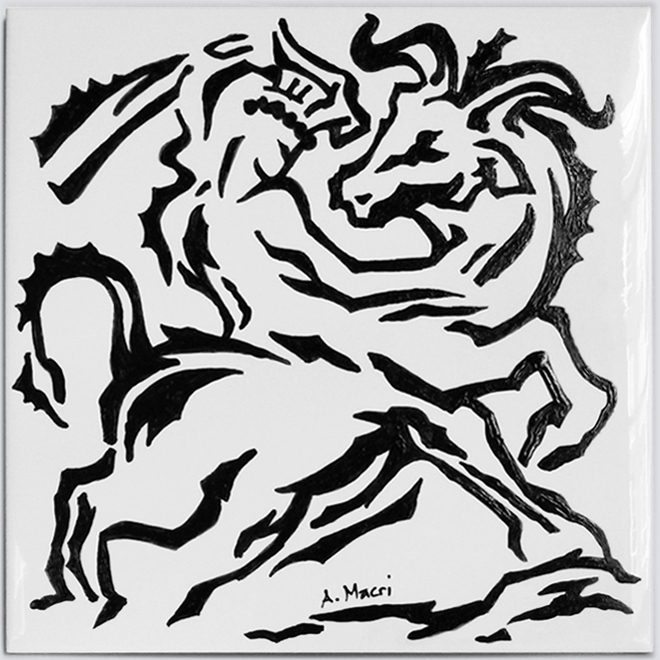 More to the point, Ancile is portrait of intriguing process, of self-creating other identities achieved by careful application and balance, of elements and symbolic suggestiveness as detailed as the complex shield of Achilles. Of course, there are the shielded eyes. A separate study could be written on the eyes in Macri’s portraits, and I fancy doing so but fear becoming enraptured. He makes dramatic and meaningful use of sunglasses, masks, or theatrical mascara, all forms of dramatic eyewear, inextricable from the persona, of hidden identity (e.g. The Bat, the Birds, and the Beasts, Prospero Sycorax Ariel, or Capo di Monte). The thin metallic looking, butterfly-winged, and latticework of the mask over the eyes in Ancile serves the same purpose. Looking closely, viewers can see one eye peering directly at them, the other eye obscured by shadows. I am unnerved to sense the person examining me, or other persons behind the shield, as I examine them, a neutral pronoun because gender here shifts and alters, depending, if I may echo John Berger’s famous phrase, upon one’s ways of seeing. In Macri portraits, the eyes are usually lowered or looking off to one direction (a notable exception is the striking image of Damo, 2013), avoiding the viewers’ searching gaze, although aware of their presence. I cannot know what this persona in Ancile thinks or feels except in what is revealed through association and symbol, and then I know what I think. Nor can I know the desires of the gender peeking out between the seemingly delicate thin bars of the mask. The figure everyone imagines in the portrait has emerged from behind its shield of shadows, bathed in dusty gold light. I sense the presence of others. So much being hidden or implicit, meaning is what I (or we) project. I wend my way through the labyrinth of my understanding, trusting in the thread I’ve unwound, alert for signs of the Minotaur, which I myself may have engendered. Of shadows, their ambiguities and subtleties, of the truth of theatre, of the multiplicity of protective shields and the creative matrix of identities, Macri is a master.